Your mission is move through each challenge with perfect form. You must complete challenge 1 before you move to challenge 2. There are 2 options for each challenge. If you need a 3rd, text me. Move as fast as possible and record your time when finished. Good Luck! 1. 100 KB Swing and/or Kb Sumo Squats: 30% of Body-weight. 7. 25 Burpees (chest to ground) and/or Pullups. Are you fit and strong compared to people in your age group? Do you consider yourself strong, fit and capable? 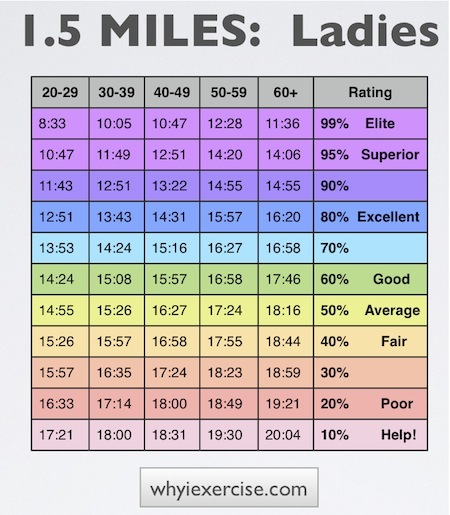 Take the Cooper Test and find out how well you compare to your peers. These tests of strength and endurance give you an objective way to measure your fitness and set goals for the future. The figures in the charts below came from research on 1000s of people, so every time you test yourself, you will have a clear comparison to people your age. Before you begin, please warm up with a brisk walk or light jog (5-10 min) and a few gentle stretching exercises. Note: Please get clearance from your doctor before taking any strenuous fitness test like the Cooper Test. Cardio Test Instructions: Go to a 400 meter track (at a school) or measure a distance of 1.5 miles on a flat surface. After warming up, run / walk 1.5 miles at your best effort. 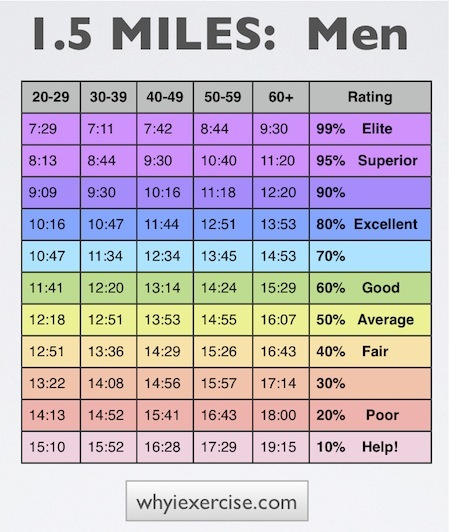 When you are finished, compare your results with your age group in the table below. Note: In recent studies, those in the highest 1/3 of fitness level had the lowest risk of future health concerns, while those in the lowest 1/3 had the highest risk.